It’s a relatively new acronym. Some of you may not have heard it yet. The millennials amongst us pride themselves on coming up with it and suffering from it. I speak of the acronym FOMO. F – O – M – O. 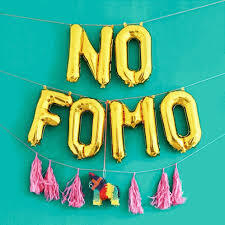 It stands for: Fear Of Missing Out, FOMO. We can blame this social-media-fueled syndrome on the fact that everyone is always posting what they are doing, what they are eating, who they are hanging with, what parties they are attending, how much fun they are having, what great tropical vacation they are experiencing while everyone else is freezing to death. There is so much to miss out on and it is all right there on your phone, on your computer, and on your ipad. And all of this awareness of what you are missing out on can certainly create a fear that is a real day killer, and over time a life stealing anxiety. FOMO. But, if you are like me and are one who does not like to miss out on good times, fun experiences, rich relationships, then you may, like me, say to millennials – this FOMO is nothing new. This is not a 21st century syndrome. Yes, it is aggravated to new heights because of all the posting, tweeting, and hash-tagging that is going on. But FOMO has always been here. In the past, we just didn’t know all that we were missing out on to be filled with fear. Ours was regret and despair when we heard about what we missed out on afterward. In fact, I would like to suggest that FOMO is part of the human condition. It has been with us from the beginning. From the very beginning. I even see its presence in the Garden of Eden. What does the serpent say to tempt Adam and Eve? “If you eat of the fruit of the tree, you will not die,” he says, contradicting what they heard from God. He goes on saying: “God knows that when you eat of it your eyes will be opened, and you will be like God, knowing good and evil.” The serpent played on their FOMO. He knew that they didn’t want to be left out of being equal to God. And there is a myriad of examples of FOMO getting humans into trouble ever since. Whether striving to be God or struggling to be connected to all things, coveting our neighbor or warring to control, FOMO is there through it all. The people of Nazareth are having a bout of FOMO in this morning’s gospel reading. Today’s reading is such a sequel to last week’s reading, that the first line is a repeat of last Sunday’s last line. Just to do a quick “previously on” recap – Jesus had started his public ministry. Word was spreading around Galilee that he was a wise teacher and a miracle worker. Then he returned to the town of his upbringing – Nazareth – and went to synagogue on the Sabbath. They asked him to read. He read from Isaiah about making captives free, and the blind to see. And then sits down with everyone staring at him. And he says (the first line of today’s reading): Today this has been fulfilled in your hearing. Now these next two lines could be read in a couple of different ways. By “all” Luke could be speaking of everyone throughout the country side who spoke well of him, but THEY – his fellow Nazarenes – could only see that he was one of them and therefore couldn’t be anything special: “He’s just Joseph’s boy.” To which Jesus responds that this is a typical response for those doing God’s work. OR, we could read it that the Nazarenes themselves were amazed at his wisdom and gracious words and sought to be considered insiders, special even, because he was one of them. Either way you look at it, Jesus reminds them that God has a history of coming to the outsider, to the one who is missing out by humanity’s actions because they have been left out by those who consider themselves insiders. So, their FOMO is going to be aggravated either because they will miss out because of their prejudice and their failure to see who Jesus is. OR they will miss out because Jesus has come to seek the lost, bring forward the last, and lift up the least. The funny thing about this FOMO that they are experiencing, which turns kind of violent when they consider throwing him over the cliff. The funny thing is, that they will only feel that they are missing out if they think they are insiders and deserving of God’s mercy and grace that comes through Jesus. If they see that everyone- even themselves, his friends and neighbors – that everyone is somewhere in that lost, last, least paradigm, then no one is missing out. So, only by God’s inclusive love, no one need have FOMO. That cranky prophet Jeremiah is having a bit of a bout of FOMO himself. At first glance, one might question my observation. In fact, one could say he is trying to miss out. Here we read of the call of the prophet, God wants him front and center, speaking to the people on behalf of God, and Jeremiah is trying his best, saying everything he can to get himself to miss out. He doesn’t feel qualified for the life of a prophet. No, Jeremiah’s FOMO is a fear of missing out on a quiet, undisturbed, unchallenged life. Let the king, the temple, the nation go to hell, he just wants his cottage, family, a couple of sheep, and little plot of ground. That’s the life he doesn’t want to miss out on. Doesn’t want his call to take all that away from him. But as we heard from Frederick Buechner’s mini-bio, Jeremiah totally missed on that life. And perhaps, when we take a full look at our call to be disciples of Jesus. When we really hear him say: “Go and do likewise.” “When you do it to the least of these, you do it to me.” “Love your enemy.” When we really let those commands sink in and change us and how we live, then maybe we realize how much like Jeremiah we are. We know we don’t miss out on God’s grace, but perhaps we would like to miss out on God’s work. We can’t do it. It’s beyond our abilities. It will cause us to miss out on the me-centered life. Lots of FOMO there. What a treat to hear this famous wedding reading (1 Corinthians 13) outside the context of a wedding and in the context of talking about God’s inclusiveness and our challenge to embrace the work God is calling us to. For only through love, can our fears of missing out be stilled, AND only through love can we begin to hear the call to not miss out on living the fullness of our new life in Christ. Everything else that is calling to us and that we think will fulfill us is just a lot of noise. It is what we do out of love for God, others, and ourselves that matters, that endures, that is not to be missed. Love is patient – also translated, long suffering. (Oh, how we want to miss out on suffering.) Love is kind, making sure that no one feels FOMO. Love is not self-centered. It does not rejoice in the FOMO our “wonderfulness” cultivates in others. Everything else will come to an end, will fade away, and it will not be missed. But love and what we do in the name of love never ends. God says it to Jeremiah: Fear not, I am with you. Jesus says to us: Fear not, I am with you. You are not missing out, in life or in death, in good times and bad, though the work be challenging or be it light. You are loved so that you might love. Here there need be no FOMO.